Posted May 17, 2018 by Eds. Yesterday on the TV screen, I watched a beautiful black Israeli singer of Ethiopian origin sing ‘Halleluja’ as part of the festive opening ceremony of the U.S. embassy in Jerusalem. Minutes later, the funeral of a local paramedic, led by an ambulance and flanked by two fire engines, passed by my house in the western region of Gaza City. Three minutes after that, another funeral, this time of a boy, maybe 14 or 15 years old, processed towards the cemetery, accompanied by the usual chants and wails of grief. In one of the cars that accompanied the funeral, I could see a man whose face was in utter shock and whose arms and hands were thrown on his knees in a posture of complete exhaustion. Back in my living room, Netanyahu was giving his speech about how the greatest power in the world has just moved its embassy to Jerusalem and what a great place the State of Israel therefore was. The ceremony was like a scene from a dystopian science fiction movie, where the wealthy oppressor calmly unveils his latest symbol of cosmic oppression while far away, out of sight and thought, oppressed masses are being executed. Less than an hour’s drive away, people were literally fighting iron with bare chests. What made this gathering more chaotic than previous marches was that it was specifically timed to protest the U.S. embassy’s relocation. Days before, a general strike had been called for; and all sides of the Palestinian political spectrum had intensified calls for greater participation just the night before. In another dystopian scene, even the mosques’ minarets were broadcasting calls for greater participation in the same rhythmic style as traditional Eid chants. The embassy relocation was planned to take place a day before Palestinians commemorated the greatest loss in their history. What we view as 70 years of humiliation, deprivation, oppression, and slow but effective ethnic cleansing has now been rounded off with this – and our objections to it have come at a high price: 56 lives to be exact, and nearly 1900 wounded, yesterday alone. Witnesses talk of young boys running directly into the barbed wire facing live bullets – they break free from history for a moment. They feel free and in control of their own lives for moments or seconds. These young men and women are not stupid or simply emotional (although nothing is wrong with being emotional in such a context), they are simply fed up. And they can see, very clearly, what is happening around them and what has been happening around them all their lives.They know that if they don’t run for their lives, nobody will save them from a brutal force that disregards their lives and basic rights. This scene of sheer desperation that has enveloped the Gaza fences today can only remind us of the aftermath of the mass expulsion of the Palestinians in 1948, precisely what the march is trying to turn our attention towards. When 250,000 refugees first arrived in the Strip their immediate prospect was to starve, just as Gazans have been starved of basic supplies, medicines and clean water for the last 11 years. Then, like now, Israeli militants surrounded the Strip and prevented anyone from leaving: anyone who attempted to leave was shot on the spot, or captured and then released in an unknown location in the middle of Negev desert, left to die of thirst. The TV screens’ smiles and the decorous speeches, drizzled with victimhood, were drowned out again, a few minutes later, by yet another funeral passing by. Kushner talked of his ancestors being Holocaust survivors who had fled the Nazis to the forests of Russia. The irony was almost unbearable. 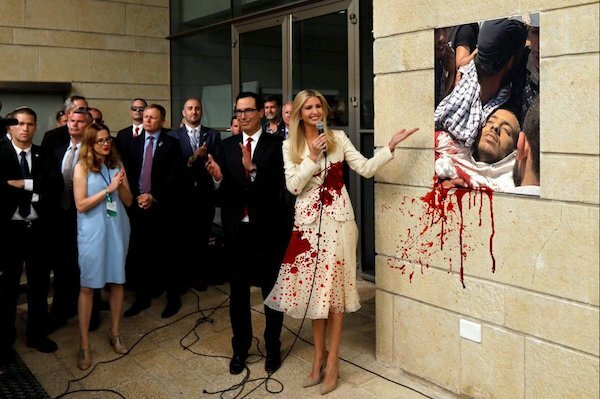 Kushner and his glamorous wife seem to be sleepwalking through the snipers’ guns, currently mowing down Palestinians in Gaza, which might very well be filled with the same bullets those Nazis would have fired at his ancestors: encased in nationalism, tipped with populist appeal back home. Outside the embassy itself, protestors were being assaulted. In the West Bank too, protesters took to the streets only to be met by teargas canisters and more bullets. Israel’s arrogance and complete disregard for human rights and international law today is only a continuation of what this colonialist state has been doing since its existence. The opening ceremony of the embassy, as well as the nauseating tweets of Trump and Netanyahu, confirm and conclude Israel and the U.S. view Palestinians as unworthy of the basic right to live, let alone speak. Both confirm a complete incapability of engagement in any true diplomatic discussion with anyone of us about any of the facts surrounding their embassy move. If only Palestinians were not sub-humans, if only we had hundreds of millions of dollars to compete in lobbying efforts before heading to the border to demand our rights, as human beings. The families of those who were shot dead have buried their dead and will mourn them for the rest of their lives. Those who are injured will battle through their wounds maybe for a few months and maybe for life, disappointed with what the human race has come to. For Gaza, it was a sad day from which people woke up in shock. Our lives only too real, not science fiction.